Morgan Tsvangirai, the main opposition leader in Zimbabwe, addresses protesters outside Parliament in Harare in November 2017. Zimbabwe's leading opposition politician, Morgan Tsvangirai, who was the arch political rival of ex-President Robert Mugabe, has died in a hospital in South Africa. He was 65 and had colon cancer. Tsvangirai (pronounced chan-ghee-RYE) came to symbolize courageous resistance to Mugabe's repressive regime — and changed politics in Zimbabwe. As hard as he tried, he never managed to oust Mugabe at the ballot box. But the charismatic mineworker and labor union leader turned politician, and founder in 1999 of the opposition Movement for Democratic Change, came close. Tsvangirai's many opposition supporters, rights campaigners and observers in and out of Zimbabwe were convinced he won outright the first round of the 2008 presidential election against Mugabe. At the time, Tsvangirai told NPR he was confident of victory and change in the southern African nation and that he had popular support for an end to cronyism, corruption, repression and economic mismanagement under the country's longtime president. "The hope of the people is really to see this change, so that they can start to reverse all the misfortunes they've experienced under this regime. They see any change bringing a new, better life, a new Zimbabwe emerging out of that change. Anything is better than what is taking place today," Tsvangirai said. Born on March 10, 1952, to a poor family in the central province of Masvingo, Tsvangirai knew about the hardship faced by fellow black Zimbabweans. He said Mugabe's misrule meant more suffering for the people and described talking to voters in opposition strongholds. "Literally the desperation is written on their faces," Tsvangirai said. "And when they see me, they just light up. That inspires me." He also warned that a campaign of state-sponsored violence unleashed by Mugabe against the opposition would make a transparent runoff election difficult. "The cessation of violence is imperative if there is to be some semblance of normalcy in the election," Tsvangirai said. "If this rate of violence continues, then certainly there is no way we can have a free and fair election." He stressed that his party's "commitment to nonviolent democratic change has been the focus of our values. It's about trying to do something about Zimbabwe." But just days before the poll, Tsvangirai pulled out of the second-round vote, pointing to beatings, killings and arbitrary imprisonment of opposition supporters by Mugabe's security forces. There was global indignation when Mugabe was declared the winner of the election. In a bid to ease the political tension and end the turmoil across its border, neighboring South Africa stepped in to broker protracted negotiations between Zimbabwe's two political rivals. Months of mediation led to a power-sharing deal, with Mugabe remaining as president and Tsvangirai a reluctant prime minister in a coalition Cabinet. He was sworn in in February 2009. After taking the oath of office as Zimbabwe's new prime minister, Tsvangirai warned that the political marriage was not an ideal settlement, nor would it be easy. He appealed for compromise and progress. "There can be no turning back on the political agreement which each party has signed — knowing it is not the perfect agreement, but still a workable one," Tsvangirai said to loud applause at Zimbabwe's elegant colonial State House building. Mugabe had routinely taunted Tsvangirai and dismissed him as a stooge of Western powers, accusing his party of being backed and bankrolled by Zimbabwe's white minority. But the ruler uncharacteristically extended an olive branch to his erstwhile political enemy, as they began sharing power. "I offer my hand of friendship, warm cooperation and solidarity in the service of our great country and people. Ladies and gentlemen, if yesterday we were adversaries, today we stand united. Today is a great and historic day for Zimbabwe," said Mugabe. Barons of the governing Zimbabwe African National Union-Patriotic Front party and the hierarchy of the closely allied security forces had vowed publicly that they would never accept a president who had not fought in the liberation war, which Tsvangirai had not. The coalition government turned out to be a testy and checkered experiment. Despite global goodwill toward Tsvangirai as prime minister, Zimbabwe's economy hit rock bottom, with unparalleled hyperinflation that Mugabe's government blamed on sanctions imposed by the United States and other Western powers. Four years later, power-sharing was over. Observers believed that Tsvangirai's movement had been co-opted and politically neutered by Mugabe, a savvy political operator, whose divide-and-rule tactics succeeded in splitting Tsvangirai's MDC party. Tsvangirai was accused of losing credibility and living a lavish life in a big house. 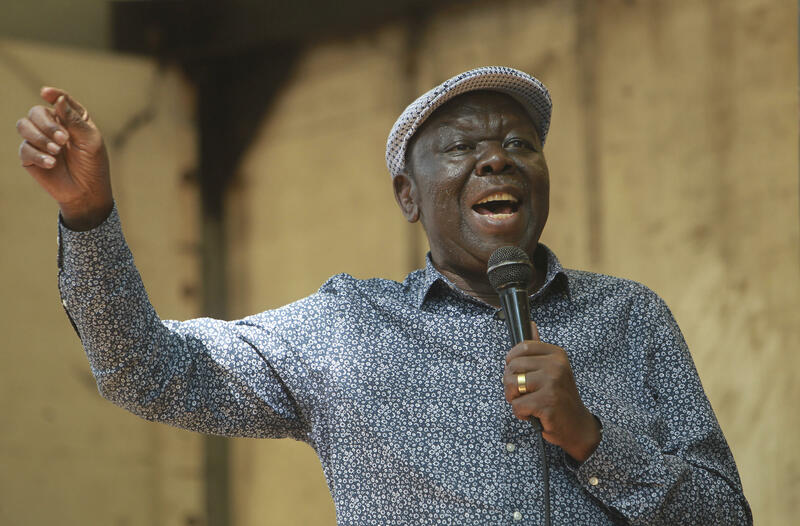 Despite divisions and breakaway factions within his party, Tsvangirai returned to the campaign trail to try to unseat Mugabe again in elections in 2013. It was another hopeful moment — but Tsvangirai lost and cried foul. "It is a sham election that does not reflect the will of the people," he told reporters, disputing Mugabe's victory and denouncing what he called a "huge farce." Four years later, in November 2017, when at 93 Mugabe was driven out of power in a military takeover, backed by the people in Zimbabwe, a frail and ailing Tsvangirai was by then visibly suffering from colon cancer. He said it was about time Zimbabweans were free of repression, political violence and economic misrule, but he was not embraced politically in a unity government by Mugabe's successor and erstwhile ally, Emmerson Mnangagwa, who said such a move was not necessary. In January, Mnangagwa visited Tsvangirai at home. Shortly afterward, Tsvangirai hinted he was poised to retire as head of the MDC after 18 years at the helm and would not lead the party's campaign ahead of scheduled elections in Zimbabwe later in 2018. Tsvangirai issued a New Year's statement saying he was "looking at the imminent prospects of us, as the older generation, leaving the levers of leadership to allow the younger generation to take forward this huge task." "New hands ... to take this struggle and this country forward," he said in a statement that read like a resignation letter. Speaking about his relations with his political adversary, Tsvangirai was asked by NPR in 2008 what he thought of Mugabe. The then president had once been considered a savior, with firm national and global support, when he came to power in 1980 after Zimbabwe's guerrilla war for independence from white minority rule. "Robert Mugabe invokes these conflicting emotions," said Tsvangirai. "There are some who forgive him for what he has done after independence — which is horrendous and unforgivable. But there are others who also know Robert Mugabe as the patriotic Zimbabwean committed to the freedom of the people. So you do have that conflict of emotions." Tsvangirai acknowledged that he had once supported Mugabe. "For me, I think that the first decade of independence, Robert Mugabe was my hero. I think he deteriorated and was transformed from a hero into a villain — and now into a real tyrant. And it's very unfortunate." In 2017, after Mugabe was driven from power, Tsvangirai said that despite the troubles the longtime leader had brought to Zimbabwe, he was an old man and should be allowed to live out his remaining years in peace. A generous gesture from a Tsvangirai who had himself been beaten and repeatedly jailed on Mugabe's watch over the years.